Cairns MTB folk are stoked and rightly so. 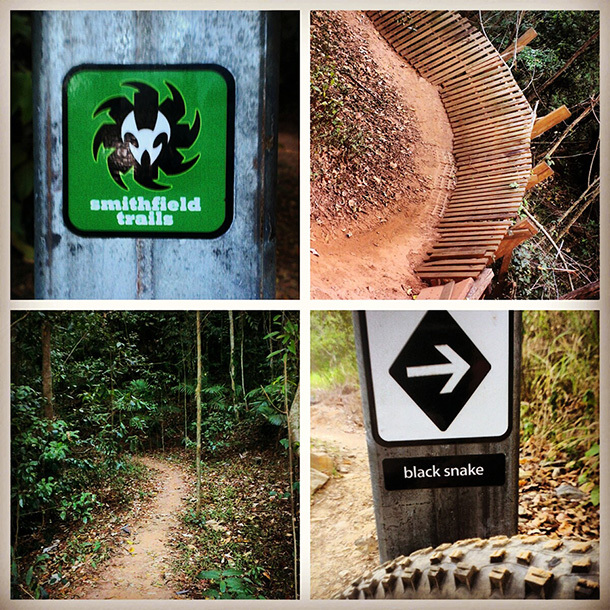 Cairns MTB folk are stoked and rightly so. Not only is their awesome Gravitate MTB Festival only a few weeks away, but earlier in the year it was announced that Cairns had secured the 2017 MTB World Championships along with UCI World Cups in 2014 and 2016. All the action is set to happen at Smithfield with World Trail on the job, busily rebuilding tracks in preparation for the cross country and downhill events. After riding The Bump Track at Mowbray in the morning I cruised down the stunning coastal drive from Port Douglas towards Cairns. Next stop: Smithfield MTB Park! Most of the afternoon at Smithfield was spent wheeling around the trails with Glen Jacobs, a down to earth passionate MTB bloke if you’ve ever met one. Glen is regarded as being one of the worlds first ‘Professional Mountain Bike Trail Builders’ with his company World Trail responsible for putting the smile on many a mountain bikers face both in Australia and overseas. Suffice to say I soaked up the experience, made even cooler by having just ridden World Trail’s latest creations at Atherton Mountain Bike Park the day before. With the day coming to an end there was just enough time to get out for a few runs on my own. I headed straight for Black Snake, probably the funnest run at Smithfield ATM, at least until the new World Cup trails open! Black Snake features a very cool tight switchback climb right beside a waterfall followed by a fun flowing descent, similar in style to Ricochet in Atherton only scaled down somewhat. After Black Snake I decided to check out Happys, a handbuilt black diamond descent higher up the hill, before ending the day with a final run down Black Snake. And just like that it was time to pack up and start the 5-6 hour drive back to Ayr. The afternoon at Smithfield was a blur of rainforest fun. I’m looking forward to revisiting it sometime soon! Just read the whole travelogue, what a trip! Hehe mate there has been some fun riding along the way, won’t deny that! It’s been great to see MTB firing in so many places.